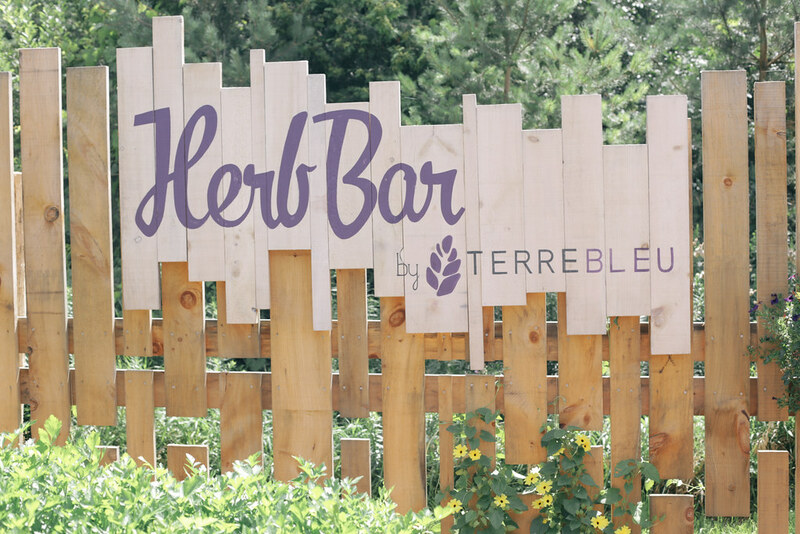 One of the most memorable day trips this summer was to Terre Bleu Lavender Farm. About an hour north-west of Toronto, this gorgeous little farm had fields full of gorgeous lavender blooms. We went on a busy Sunday morning, but luckily got there early enough to snap some incredible pictures. I’m wearing a floral wrap dress from Zara (similar floral dress here), glitter sunglasses from Miu Miu (cheaper glitter sunglasses here), leather sandals from Clarks and a Cult Gaia Ark Bag. 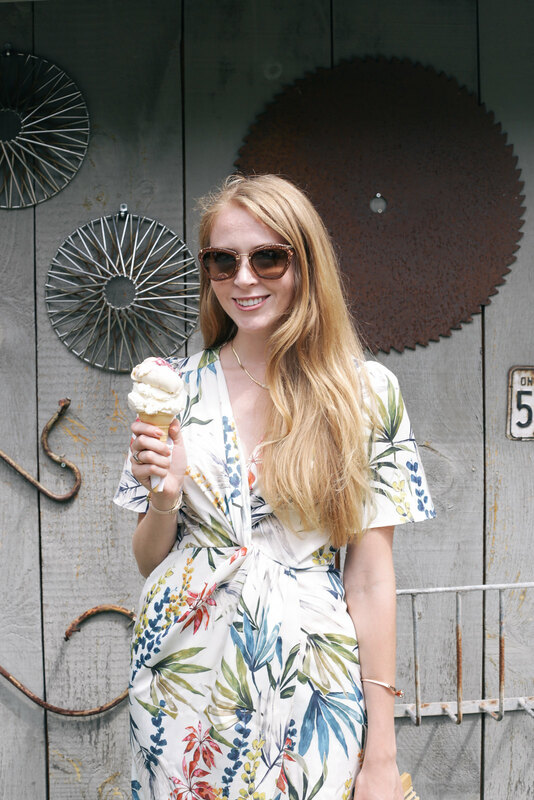 This wrap dress was super breezy and perfect for a day trip. 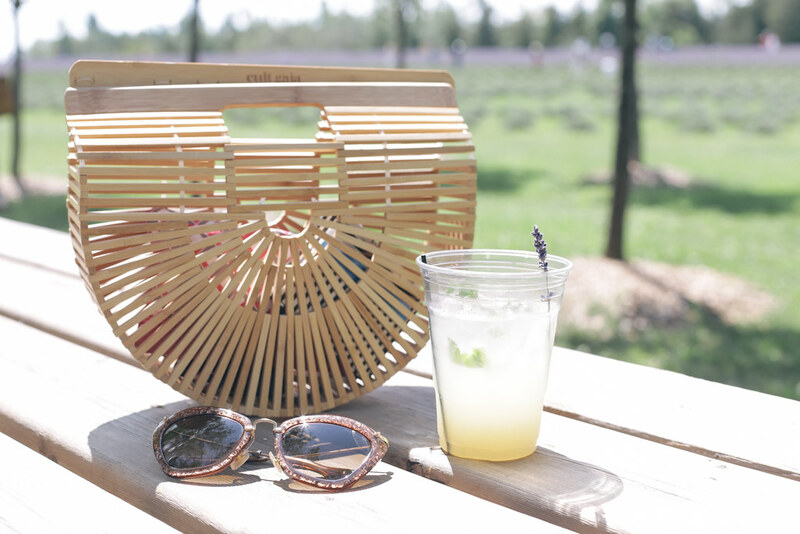 My leather sandals were practical and super comfortable, while my Cult Gaia bag was the perfect accent piece to add some “French” whimsy to my floral look. I love wearing neutral accessories with printed dresses, for a more subdued look. While the lavender blooms are now over for the season, I really enjoyed getting a tour of the farm. 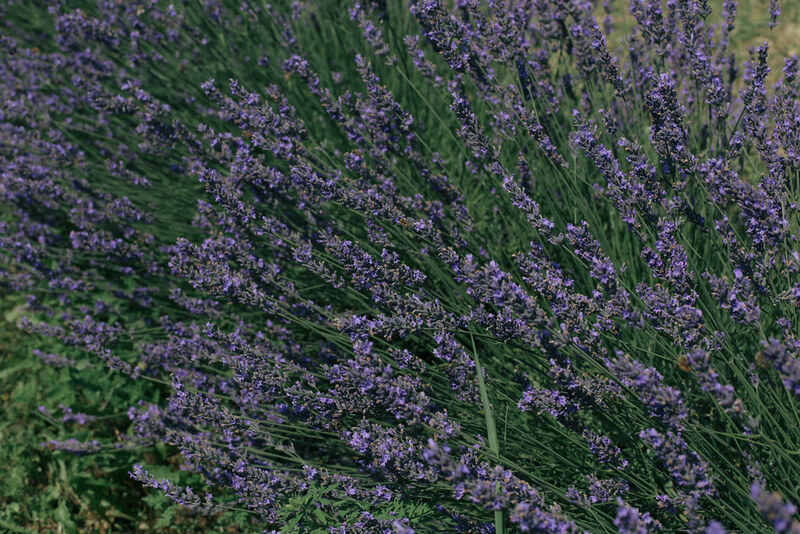 Terre Bleu Lavender Farm grows both English and French lavender. It was interesting seeing the distilling process of French Lavender for essential oil, as well as learn about their apiaries that produce lavender honey. After the tour, we visited the Herb Garden which had a mocktail bar, and I had the most incredible mojito infused with lavender. We then visited the famous yellow door, and took pictures in the fields. 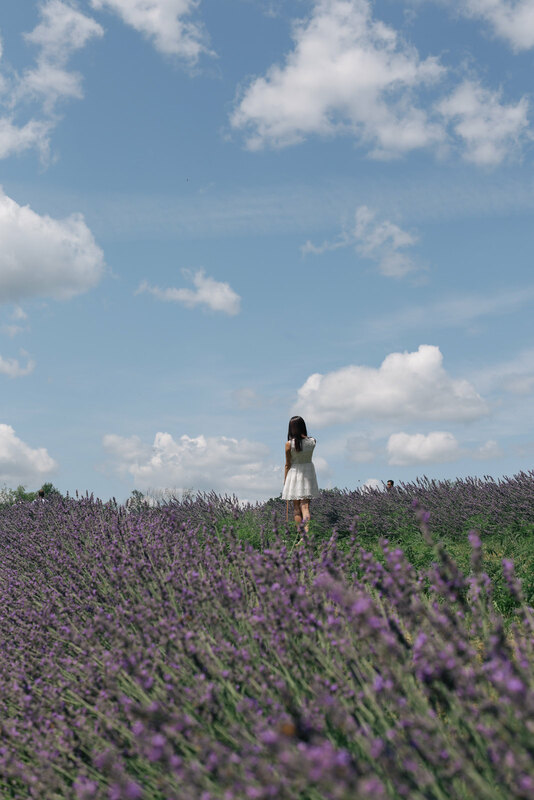 If you’re visiting Terre Bleu Lavender Farm, I recommend visiting the yellow door and back field (past the cedar forest) first thing, so that there’s less people in the background of your shots, and a shorter line for the door. The photos were incredible, and I loved watching everyone enjoy the gorgeous purple paths. 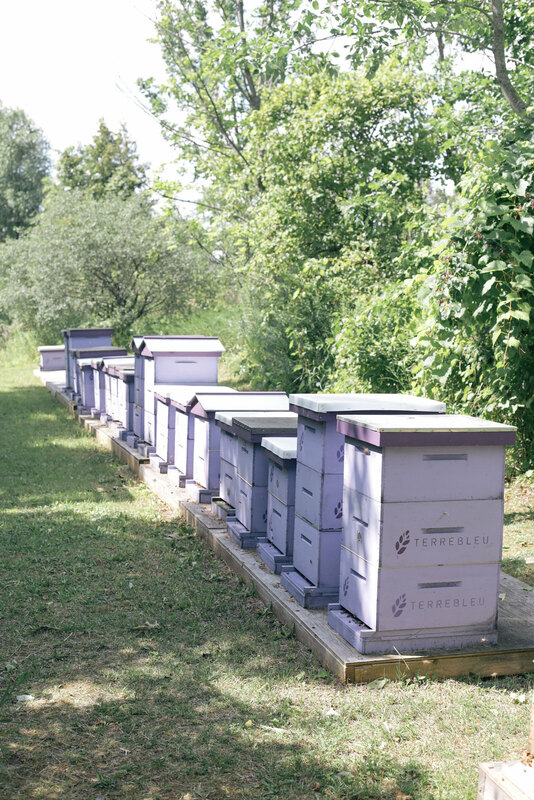 My favourite part of our visit was hearing the harmonious hum of the bees! It was truly incredible. Another tip is to avoid weekends and lineups, we sadly couldn’t get the famous Terre Bleu lavender ice cream. All the more reason to come back next year, or visit the farm in the fall to pick up some essential oil and lavender ice cream. 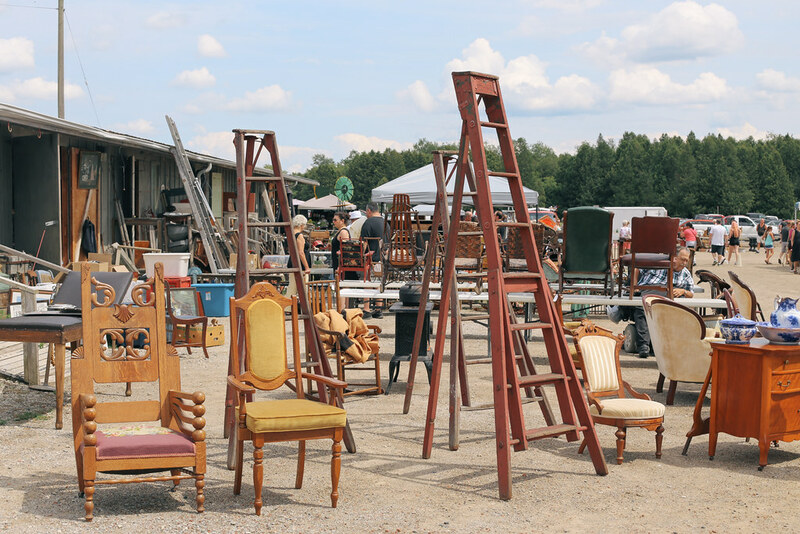 After our visit to Terre Bleu Lavender Farm, we headed to Aberfoyle to go antiquing. It was a short 10 minute drive away and full of treasures. The prices were a bit higher than the flea markets and garage sales I’m used to, but there was a large variety of items. My favourite part about the visit was the INCREDIBLE PB&J ice cream we had at Bluewater Creamery. Oh. My. God. It was unreal! I will definitely have to go back soon, and possibly pick up that pink velvet fainting couch I fell in love with! After Aberfoyle, we drove around Guelph and had dinner at Miijidaa. I loved the Piri Piri sweet potatoes and smokey caesars that were on special. I had never been to Guelph so it was nice to see the city and walk around downtown. Lately, I’ve been loving little day trips. While I enjoyed my longer trip to Madrid and Barcelona, escaping the city for a short trip is a great way to recharge and spend the day. I want to visit Niagara Falls again before the fall season, and go see a play in Stratford.